J. Penn-Bowen, Colchester; purchased in Mar. 1956 from Maggs Brothers Ltd., London for William S. Glazier (1907-1962), New York; deposited in the Pierpont Morgan Library by the Trustees of the William S. Glazier Collection in 1963. Ms. written and illuminated in England, at Coverham Abbey, Yorkshire, ca. 1500. Continuous roll, 9 membranes sewn together with chevron stitching, 1 text column. Scribe: Canon Percival; text reads: Chanon in Couerham / My name it was Percevall. 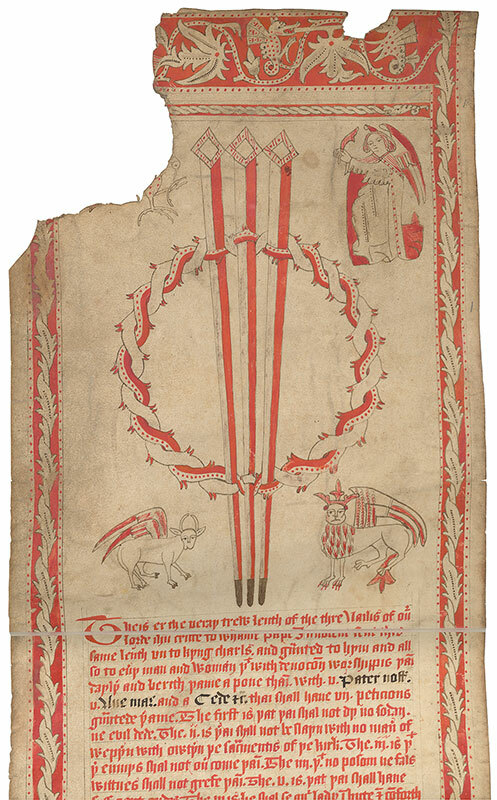 Decoration: 18 drawings in vermillion and black, 1 historiated initial, patterned bands.